The challenge was announced last fall, now it’s Spring. What site should I choose? Last weekend I’d planned to take my 93-year old Mother on a day trip, but hadn’t decided where to take her. Hum. Fortunately, she’s the daughter of an orchid and camellia hobbyist hybridizer and an avid gardener herself, so she enjoys visiting gardens. A plan took shape to combine two tasks – visiting a HALS site and spending a day with my Mother. I printed out our chapter’s list of potential HALS sites for Napa County and reviewed my options. 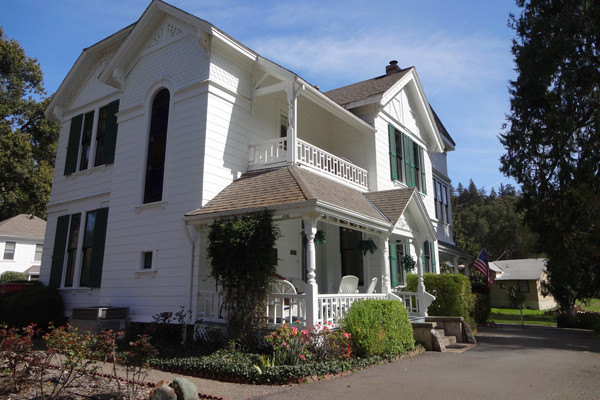 Two properties stood out – Lyman Park in St. Helena is a one-acre park built in 1942 and was a joint project of the Women’s Improvement Club and the St. Helena Band. The other site of interest was Elmshaven. The description for Elmshaven noted that it had been the home of Ellen White founder of the Seventh-day Adventist Church. That sounded perfect for this challenge. So we were off for what proved to be a perfect day. 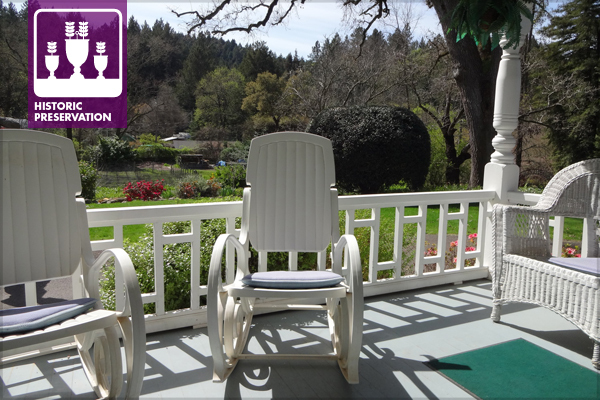 Elmshaven is located in St. Helena – part of Napa Valley’s rich wine country. Originally the property covered 60 acres when Ellen White purchased it in 1900; today it has been reduced to 3 acres and is a National Historic Landmark. The residence is a Stick/Eastlake Victorian-style. Two other buildings – White’s Office and Vault and the Tank House form the core of the site. Several mature trees surround the property – a massive valley oak, native incense cedars, a deodar cedar and of course elms of varying ages. The building cluster, trees, and the layout of foundation planting beds, defined by angled brick edging, all appear as they did in photos from White’s period of residence. 1st and 2nd floor balconies of Elsmhaven with vines and foundation plantings similar to those in Ellen G. White’s 1915 garden. Researching the site has been easy. We were very fortunate to be the only ones present when we arrived, and enjoyed a house tour led by Dennis Brown, who lives in the Tank House, and has been a docent there for three years. Mr. Brown is very knowledgeable and was happy to tailor his talk in response to my questions about the grounds and garden. The site brochure described White as a prolific writer, it notes, “She is the most translated woman writer in the entire history of literature, and the most translated American author of either gender.” In addition to religious matters she wrote about healthy living and the importance of education. She is associated with several major institutions including Pacific Union College, Loma Linda University, and several medical institutions. Finding resource material appears to be endless. I started at the National Park Service site checking to see if the buildings had been recorded by HABS (Historic American Building Survey) and the Library of Congress site. I found the complete national register nomination including the Significance section that I’ll need for my HALS form. I found a treasure trove of historic photos at the Ellen G. White Estate Gallery. With these I am able to see what elements of the landscape are extant from the time period that Ellen G. White lived at Elmshaven. So, the most difficult part of this challenge is to choose a site. Now that I’ve figured that out the rest is great fun. Our day in Napa included a fabulous lunch at Mustards Grill in Yountville and a short stop at the Trefethan Winery to get a peek at a landscape designed by Mai Arbegast in the 1970s. Short format histories should be submitted to HALS at the National Park Service no later than July 31, 2013. For more information on the 2013 HALS Challenge, contact Paul Dolinsky, Chief of HALS. Don’t forget that measured drawings are NOT required for the short form. You may include a sketch plan if you like, but that is not required. All that is needed for the short form is a brief narrative in the WORD template. Providing one or more digital site photos is also optional. For more information about HALS, visit the ASLA website. To read more about Elmshaven, the site and it’s history, and the challenge, visit Chris Pattilo’s blog.